I’d like to talk about oneness. Oneness is very important. St. Paul emphasized oneness very much. Oneness is kind of a harmony being together… it is in perfect harmony, that’s what oneness is. We don’t see oneness very much around us in this world. We are living in a fractured, very divided world. But this unity, harmony, peace, oneness… this is an essential quality for humanity to survive, and for any human beings to live meaningfully and joyfully. And this oneness, harmony, peace, and reconciliation… it all comes from who God is, and God is one. To St. Paul, unity was important. You see, the letter to Ephesians is different from the letter to Corinthians or Galatians or other letters because in the other letters, Paul responded to concrete problems in a particular community. But in Ephesians, it is written generally to all churches, not just one particular community. So Paul is not talking about issues of division necessarily, but Paul is talking about the universal principle of being one, the universal principle of oneness. He realized that Jesus Christ came to this world to bring that unity, to bring that harmony. God saw how broken the world was, God saw how fractured the world was, so Jesus Christ was sent by God to bring about that unity and harmony. And Paul realized that that was the purpose of Jesus coming into this world, and then that that is the purpose of our lives. We are the peacemakers. We are the ones who have to work hard to bring about the unity, harmony, and peace. That is a calling that we have. That is what it means to lead a life worthy of calling. I see so much brokenness all around… families, communities, parents, and children. They fight spouses. They struggle. One nation is against another nation. Whenever I see news, whenever I look around, all I see is brokenness, divisiveness, fracturedness – not peace, unity and harmony. The relationship between God and human beings are broken. The relationships between people to people is broken. 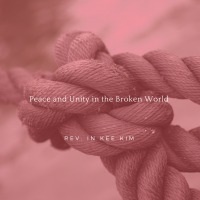 We see so much brokenness around us, and we need the message of unity. And unity is not sociological or a social phenomenon. Unity is a spiritual reality. It is a gift of God. God gives human beings the gift of unity, the gift a peace, so that we may be able to live together in harmony, enjoying each other. When you’re divided, you cannot enjoy your life. When families are all divided, you cannot enjoy being there. When the community is so broken and divided, you don’t want to be here. It is a gift of God to humanity, to live together in peace and harmony. But I see so much of brokenness, and the brokenness comes from the hostility. This is what St. Paul said – it is the same book in the second chapter, you probably have it in your slide – “For He is our peace.” The ‘He’ is Jesus Christ. “He is our peace in his flesh. He has made both groups into one and has broken down the dividing wall.” And that dividing wall is the hostility. The dividing wall, that is the hostility between us. In other words, Jesus came and took out their hostility so that two groups may become one. That was the dividing wall. The hostility was a dividing wall, and Jesus Christ took away that hostility, that dividing wall, so that they could become one. That’s what Jesus Christ did. Two Sundays ago, or three Sundays ago, I preached about letting us turn hostility into hospitality, and that is so much needed. We need to turn hostility into hospitality. Within us, we have hostility, tremendous hostility. If you have anger within you, if you leave it in your heart and let it brew or let it breed, then that anger becomes hostility. There are things that you can hold in your heart for a long time and is okay, but there are things that you cannot – you should not hold too long within you because it will poison you… and one of them is anger. If you have anger within you for a long time, that anger turns into hostility, and that hostility divides people. When there is that hostility, the reconciliation, peace and harmony is not possible. You can get angry – we all get angry sometimes – but you cannot let anger stay within you for long time. As soon as you have that anger, you have to learn how to let go of that anger. In the same chapter, in the same letter, St. Paul said this, “Be angry but do not sin.” Paul said, “You can be angry. That itself is not sin.” You can be angry, be angry, but do not sin. Do not let the sun go down on your anger. Why? Because it becomes hostility. Verse one and two are very crucial in our reading today. St. Paul said, “I beg you to lead a life worthy of the calling to which you have been called, with all humility and gentleness, with patience, bearing with one another in love.” It’s very interesting. Paul said, “I beg you.” He didn’t say, “I recommend you” or “I advise you.” He said, “I beg you,” because it’s so important. I beg you to work out, work together to bring about peace and unity. It’s the same feeling that I have. I beg you, all of you, to be peacemakers. To bring about unity in your family, with friends because we see so much of hurt, pain, division, anger, and hostility. I beg you to lead a life worthy of calling to which you have been called with all humility, gentleness, patience, and love. Bear with one another in love. No one is perfect. Hi-C students, your parents are not perfect. Parents, your children are not perfect. Friends, your friends are not perfect. Because they are not perfect, sometimes they hurt us. Because they are not perfect, they hurt us. When you get hurt, do not reject them, do not shy away from them. Embrace them. Bear with one another in love. Otherwise we cannot survive. If we reject everyone who hurts us, we have no friends left. We have no person that we can live with left. Bear with one another in love. Paul said, “Humility, gentleness, and patience… they’re all fruit of spirit.” It’s not personality. Only spirit can give you that. Only through the spirit we can bring about the unity. Peace and unity are God’s gift for all of you to live joyfully, meaningfully, and happily. That gift, I believe is much more precious than money or luxury or houses or cars. That gift of peace is the greatest gift that God can give to us. The gift of unity. Enjoy it, cherish it, but when your heart is not ready, you cannot receive that gift. It’s not like Loteria, you just take it. No, we have to work, we have to be ready spiritually to receive that gift. Bear with one another in love. Deep wound within us cannot be well kept within us. It will come out somehow, so when we have a deep wound within us, it will hurt other people. But I pray that that wound that you have within you may turn into wounded love, painful love, which is compassion. Come together. Passion meaning suffering, suffer together. That’s what compassion, compassionate love is all about. I hope that our wound within us may turn into that wounded love, that painful love, so the you may suffer with others. Ralph Waldo Emerson said, “Peace cannot be achieved through violence. It can only be attained through understanding.” Roman peace, you may be able to achieve with violence, with force, but Christian peace or the peace that Christ gave, you can never achieve it through violence, only through understanding. When you have a deeper understanding of each other, you will be able to be peacemakers. Let us sing together.